Custom Printed Swim Club Flags! If you really want to stand out at the next swim meet, you have to make sure you bring along personalized swim club flags from Australian Flag Makers! Everyone on the team works hard and feels passionate about being a member of the swim team. Bring everyone closer together and boost team spirit among swimmers and spectators with unique swimming flags that can be completely designed by you! No detail is spared to ensure your design looks exactly the way you want it to look. You can send us your design, or we can help create a custom design for you. 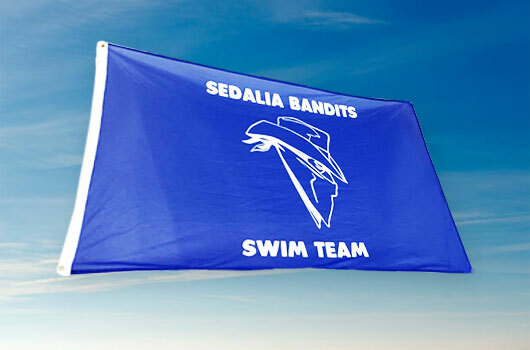 Swim club flags can be ordered in any size you can imagine, and we can even create unique flag products like table flags, car flags, cape flags, and much more. If you can dream it, we can do it at Australian Flag Makers. When waving swimming flags, you don’t want them to melt into the background. You want to make sure they stand out. The best way to do that is with vivid colors, and we can recreate them all. With our dye sublimation process, we can print as little or as many flags as you want, matching the colours in the flag to your logo or image perfectly. Not only will you get a true-to- colour design, our inks are UV protected as well. When paired with a high-grade material, you can even fly your flag outside. Not only can you design every aspect of your swim club flags with our cool online design tool, we can also provide you with professional design advice. Just take a moment to fill out our online quote form for a free estimate, or contact us today!